Fr Hunwicke's Mutual Enrichment: "Almost Infallible" ... an old Irish joke? A priest in a country parish decided to hold a monthly Holy Hour to increase the devotion of his parishioners. He promoted it for some Sundays in advance. Come the appointed Sunday afternoon for the first Holy Hour, just before the appointed hour, he looked out from the sacristy into the nave, and saw - one old farmer. So he walked over to him and said, "Well, Jim, I suppose there's no point going on withe Holy Hour". Jim replied, "If I had only one sheep, I'd still feed him, Father." 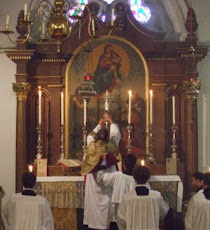 So the priest went back to the sacristy, vested, came out, went to the tabernacle, began singing "O salutaris Hostia", exposed the Blessed Sacrament, then led the Rosary and Litany and Prayer to St Joseph, preached a fervorino about devotion to the Sacred Heart, consecrated the parish to the Sacred Heart, then gave Benediction, concluding with "Hail Queen of heaven" after reposing the Host in the tabernacle. Afterwards, he farewelled old Jim, hoping to see him again next month. Jim replied, "If I only had one sheep, I wouldn't give him the whole bloody hay bale, Father!" Thank you Fr. Hunwicke, for asking about it - and @Joshua -Very good one- thanks for the laugh! Excellent, it's years since I heard that one, Joshua!